It’s all fun at White Hart Lane at the moment isn’t it? At the start of the season Tottenham‘s dreams of the top 4 were at the fore… now? It’s all gone a bit awry. Now, a spat between Martin Jol and Jermaine Defoe seems to have reached boiling point. Apparently, Jol has told Jermain Defoe to sign a new contract, or rot in the reserves. Defoe was left out of the Spurs squad for Saturday’s 3-1 North London derby defeat to Arsenal on Saturday, and The Sun claims that the Dutchman unleashed an ‘explosive tirade’ against the England striker after the game. An ‘insider’ at White Hart Lane claims Jol bellowed “I will never sell you to any top-four club. You can rot in the reserves if that’s what it takes. But I’m never going to let you leave here just because you want to go to another big club,” to Defoe. What do you make of this? Is Jol showing strength in the face of a prima donna? Or is Jol just cutting his nose off to spite his face? Defoe still has two years to run on his current contract, but Spurs want him to commit to a new deal to prevent his value decreasing, or him leaving on a free at the end of those two years. This could be tricky business indeed. If this is true then Jol is being an idiot. What does he expect from Defoe? He is 4th choice striker yet Jol wants him to be committed to the club. Some people may accept this (look at Ole G.S.) 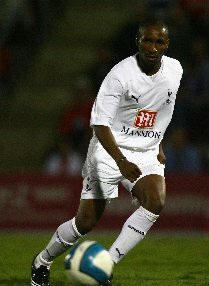 but Defoe is young and has England asperations. If Jol doesn’t think he is good enough to start for Tottenham then it shouldn’t bother him if he goes to a top 4 club because on that reckoning he wouldn’t get in their team either. Jol wants his cake and to eat it too.